Bug Report / Re: Crafting leather. Bug Report / Crafting leather. Let's say i'm just starting crafting, I start making some leather gloves, i'm making them one at a time to get the most of my xp. I level up. and i don't click the "Click here to continue". Instead i just continue to attempt to make more gloves. but by not hitting the "click here to continue" and trying to make more leather armor. It causes the crafting menu to get stuck on screen & unable to push any selection. only able to be fixed by logging out and back in. May i add to this, about %10-15 of the pot should be "kept" by the purchaser as a way to prevent inflation of gp in game. Ability to reset your daily task at least once a day. 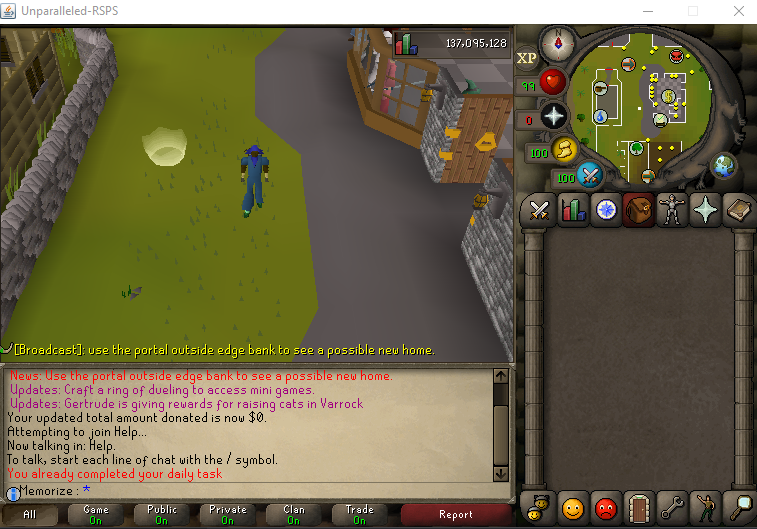 I've had 5 k'ril as my daily on my HCIM for a while now and there is no way i can do it at my level. Suggestion: By trading an npc in-game you have the chance to pay Gp to enter a lottery which draws when the pot reaches a certain amount (500m for example), which could be split between 3 players either equally or it could be split at 350m, 100m and 50m for example.